What if nature were to become a polluter, discharging millions of tons of planet-warming carbon into the atmosphere in much the same way as diesel-fueled trucks or coal-fired power plants? This nature-as-polluter scenario might seem far-fetched, but it's well on its way to becoming reality, according to a recent study co-authored by UC Merced Professor LeRoy Westerling. In a paper published recently in Scientific Reports Opens a New Window.— “Potential decline in carbon carrying capacity under projected climate-wildfire interactions in the Sierra Nevada” — Westerling and collaborators from the University of New Mexico and Penn State University used three climate models and data from the Intergovernmental Panel on Climate Change to examine how rising global temperatures and increasingly severe wildfires will affect Sierra Nevada forests. Their conclusion: Changing conditions will turn today's Sierra Nevada forests into tomorrow's greenhouse gas emitters. 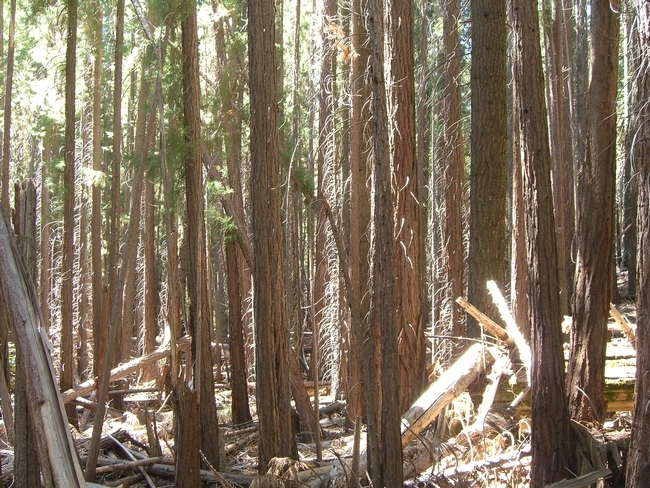 After conducting extensive forest research and taking into consideration all aspects of forest health – including fire and wildlife behavior, water quality and quantity – a group of distinguished scientists have concluded that enough is now known about proposed U.S. Forest Service landscape management treatments for them to be implemented in Sierra Nevada forests. Scientists say there is a great need for forest restoration and fire hazard reduction treatments in Sierra Nevada forests. “SNAMP was founded on a desire to work collaboratively to protect the forests of the Sierra Nevada,” said John Battles, professor of forest ecology in the Department of Environmental Science, Policy and Management at UC Berkeley and SNAMP principle investigator. “The challenges are multifaceted with a huge diversity of perspective among the public, among managers, and among scientists. SNAMP tried to bring all these interests and talents together to safeguard a vital resource and a natural wonder." SNAMP was created to help develop a collaborative management and monitoring plan consistent with the Sierra Nevada Forest Plan Amendment, signed by regional forester Jack Blackwell on Jan. 21, 2004. The amendment called for the use of fuel reduction treatments – such as prescribed burning, mechanical chopping of underbrush, and harvesting certain trees – in strategically placed areas to slow down potential wildfires and improve forest health. Because of disagreements over forest treatments in the past, which often led to lawsuits that languished in court for years, the U.S. Forest Service, U.S. Fish and Wildlife Service and the California Natural Resources Agency decided to take a new approach in 2005. They asked the University of California to provide unbiased scientific assessments of the impacts of the proposed treatments. UC was also charged with engaging the public concerned about repercussions of the forest treatments on wildlife habitat and water quality. The scientific efforts and the forest treatments were all conducted in an open and transparent process. To ensure the greatest number of stakeholders were taking part, SNAMP included a public participation team of social scientists and UC Cooperative Extension outreach professionals to conduct and study the collaboration process. Susan Kocher, UC Agriculture and Natural Resources Cooperative Extension forestry advisor in the Central Sierra, was a member the project since 2008 and served as the leader of the public participation team during the final two years, succeeding Kimberly Rodrigues, a UC forestry scientist who is now the director of the UC Hopland Research and Extension Center in Mendocino County. Kocher said having outreach and public participation included as a funded part of a science project is unusual. A large volume of new scientific information was generated by the science team, and was published in 46 journal articles. The science spread fast and far, according to citation analysis conducted by the public participation team. “The results were able to prove useful for managers past and future regarding how management can be implemented, in the face of wildfires while still retaining important owl nesting/roosting and foraging habitat features in and near owl activity features,” the document said. Working together, the scientists looked at all the research outcomes. The first 18 recommendations in the chapter are the direct result of scientific research conducted in SNAMP projects; the remainder of the recommendations are based on other scientific work and research. Each of the recommendations is linked to a management goal. Some goals may conflict with achieving one or more of the other management goals. This approach to organizing the recommendations was taken to demonstrate that, while many of the management recommendations do not clash, a few may. For example, suggesting treatments across a landscape in a way that minimizes the negative effects on wildlife might reduce the efficiency of treatments aimed at reducing wildfire behavior and impacts. The next steps are for the U.S. Forest Service to consider and adapt the SNAMP results and recommendations to continue to restore and protect the natural resources at risk in the Sierra. “My hope is the SNAMP will be seen as a promising first try to apply adaptive management in the Sierra Nevada,” Battles said. “We gained important new insights about the ecology of these forests and we learned how to conduct applied research in an inclusive manner that engages not only scientists from multiple disciplines but also managers and the public." Burning Down the House: Should Private Assets be Sacrificed to Protect Public Land? Back when mastodons and giant ground sloths still roamed the earth – the late 70s and early 80s – I worked as a wildfire fighter for the U.S. Forest Service, both on hand crews and engine crews. Our training was narrow but relatively deep. Mainly, we were taught to construct fire lines with hand tools and chain saws. Water, when it was available, generally was used to protect the line and firefighters; seldom was it employed to directly extinguish the flames. Our basic strategy consisted of digging and cutting line around the flanks of the fire, then burning out fuels to the advancing flames with fusees (devices resembling highway flares) or drip torches. In this way, the “head” of the fire could be steered to natural barriers or areas sufficiently devoid of fuels to make a direct attack possible. We received zero training for structure firefighting. The one time I responded to a burning structure was in Trinity County: A vacation cabin was ablaze due to a faulty propane line. Several engines responded. Federal Forest Service engines are smaller and hold far less water than municipal or state engines, but collectively, we mustered a lot of water on the scene. A direct attack could have been possible, but we knew our training for battling such a fire was inadequate. Instead, we dug a line around the cabin so the flames wouldn't encroach into the surrounding woods, and watched it burn to the ground. Things are different now. For one thing, wildfires are bigger and more frequent. This is due to drought, climate change, and the sins of past forest managers. In the sixties, seventies and eighties, vast tracts of old growth timber were liquidated in massive clear cuts. These deforested landscapes were replanted as conifer monocrops, resulting in expansive stands of spindly, closely-spaced, second-growth trees that are as flammable as kerosene. Meanwhile, the goal for wildfire fighters has changed drastically. The emphasis now is on “protecting interface,” which means preventing fires from immolating the homes that have sprouted across the West's woodlands like morel mushrooms after a rain (back when we had rain). This shift has made fighting wildfires far more expensive, more dangerous for firefighters, and has altered priorities from protecting public forests to protecting private assets. Wildfire fighters now receive training in structure fires, but that has diluted, perhaps even vitiated, their original mission. As Berkeley Environmental Science Professor and Wildfire Researcher Scott Stephens noted, more than half the U.S. Forest Service budget for the current fiscal year is dedicated to fire suppression; in the early 1990s, that figure was about 20 percent. Assuming the trend will continue, which seems certain, firefighting could consume 70 percent of the agency's budget by the 2020s. That means there's less money than ever for restorative work. And this is work that must be done, and soon. Unless we alter the essential characteristics of our coniferous forests, they will quite literally vanish. It's already happening: Stephens observes that significant portions of California's forests are shifting from pine and fir to mixed hardwoods or even grasslands, the result of repeated, high-intensity fires and drought. And once our conifers are gone, we're not getting them back. The change will be permanent. Even with drought and accelerating climate change, we can still have healthy coniferous forests in the West. But we won't get them by simply letting them grow — and burn (and burn). Stephens observes we need active management: intensive thinning by both mechanical means and prescriptive fire. This will result in forests with fewer but healthier trees, forests that are largely resistant to any but the most catastrophic fires. A hundred years ago, disastrous wildfires were rare in California. Forests were characterized by widely spaced, extremely large trees; You could ride through them on horseback, unimpeded. Any fires that did ignite generally crept along. They didn't have the “fuel ladders” — dead limbs and needles on the ground, brush and ascending foliage higher up — needed to climb into the crowns of the trees and explode into rolling fireballs. Being large, the trees were thick-barked and resistant to fire. Indeed, periodic low-level fires disposed of deadwood, killed destructive insects, and returned nutrients to the soil as ashes. It was a virtuous cycle, assuring healthy, resilient wild lands that depended on fires, but were not destroyed by them. That changed with the aggressive fire suppression of the Smokey the Bear era and accelerated clear-cut logging. But as Stephens notes, we can revitalize the “dog hair” (as in, thick as the hair on a dog's back) forests we now have. We can re-create the vibrant, fire-resistant forests of the early 20th century. We know how to do it. We have the tools: chain saws, heavy equipment, and prescriptive fire. It's not that complicated. But it will take political will and money. It won't require a Manhattan Project-style response —but it'll require one similar to the Civilian Conservation Corps in scope and commitment. We need to put young men and women back into the woods in force, cutting trees and conducting controlled burns. By re-introducing fire into forest ecosystems, we can, paradoxically, protect them from fire. This will entail triage. We'll have to identify those areas that are most vulnerable to fire (e.g., interface communities). The first projects should be shaded fuel breaks, strips of thinned forests around highways and rural towns and residential developments. Following that, more ambitious projects could proceed on larger tracts. Who pays? The state and feds must contribute, of course. But local communities, commercial timber companies, and private landowners must also cough up. In particular, the counties and interface residents must participate. So far, they've gotten a free ride. County planners have encouraged development in wild-land areas without thought to the implications of wildfire; After all, taxpayers have always picked up fire suppression costs. More suppression costs must be passed on to the counties so they are incentivized to discourage development in our wild lands, and homeowners must pay appropriately heavy premiums if they choose to build in the woods. Stephens estimates we have about 30 years before it's too — before our coniferous forests are gone forever, replaced with oak woodlands, brush fields, or grassy savannas. And even then, of course, the wildfires will continue. As we saw with the recent Middletown conflagration, hardwood forests and scrublands can burn just as ferociously as conifers. As long as homes intrude into the wild lands, their continued destruction is assured. We can continue down the current path of increasing fires and escalating suppression costs, or we can invest in forest restoration. The first course is a death spiral. The second will reduce wildfires, preserve the essential character of our wild lands, provide tens of thousands of jobs to young Americans, yield economic benefits ranging from timber production to recreation, stabilize watersheds, and preserve wildlife diversity. Let's just hope we do the right thing.